AMTA is proud to administer several Fellowships for university students researching the use of membranes for water treatment, with nearly $500,000 conferred since 2007. These funds not only yield cutting-edge innovations in membrane technology, but also provide career development for some of our brightest young minds. In 2018, AMTA expanded on this commitment by establishing the $10,000 Ian C. Watson Fellowship for Membrane Advancement in honor of his long and distinguished career dedicated to the beneficial application of membrane technology. 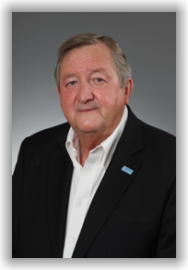 Ian is a modern pioneer of membrane processes and served as AMTA’s first Executive Director. AMTA is proud to acknowledge his vital and positive influence on both novice and seasoned membrane practitioners with this namesake Fellowship. AMTA is the leading association in the United States in the area of membrane research and membrane technology. The need to reduce the cost, energy usage, and environmental impacts in advanced water treatment and desalination is a critical need, and innovations developing new membranes or improvements to membrane technology is an essential part of the solution. Such advancement will help facilitate clean, safe, abundant, and cost-effective water supplies across the United States and throughout the world. The Ian C. Watson Fellowship for Membrane Advancement will be given to a graduate student pursuing a full-time Masters or Ph.D. at a University or College conducting research in innovations for water treatment in membrane related research. Funding is provided by the American Membrane Technology Association. A condition of the Fellowship is that awardee will attend the 2019 Membrane Technology Conference and Exposition and give a poster on their research. The 2019 MTC will be held in New Orleans, LA on Feb. 25 – Feb. 28, 2019.